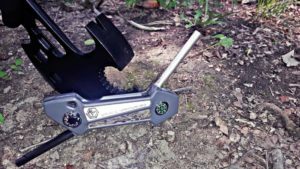 In this review we are going to take a look at the Survival Axe by Off Grid Tools. At first glance this axe looks like some sort of over ambitious survival tool that could be cobbled together by a survival expert. When I got my hands on the survival axe it became apparent that this tool is worth the added weight. 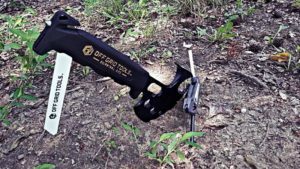 Off Grid Tools offers a small selection of tools that could be of assistance in many scenarios. These tools are designed to offer a number of solutions with each. The obvious foundation of this tool is the AXE portion of the survival axe. The base is made of 1055 Carbon Steeland the axe portion is full tang. The total weight of this product is 1.6 lbs. 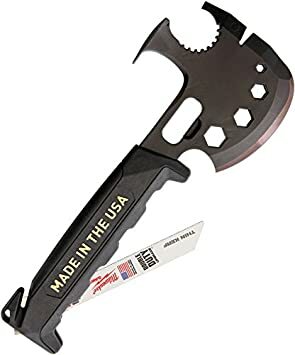 While the tool is called the survival axe its dimensions and the blade are much more of a hatchet. It is under a foot in total length. Had it just been a full tang hatchet with a nice handle you might justify the added 2 lbs to the pack. This tool comes with many more options. Some of them are slightly questionable but for the most part its full of options that will only enhance your adventure or survival situation. Let’s have a look at the many options that the survival axe offers the user. 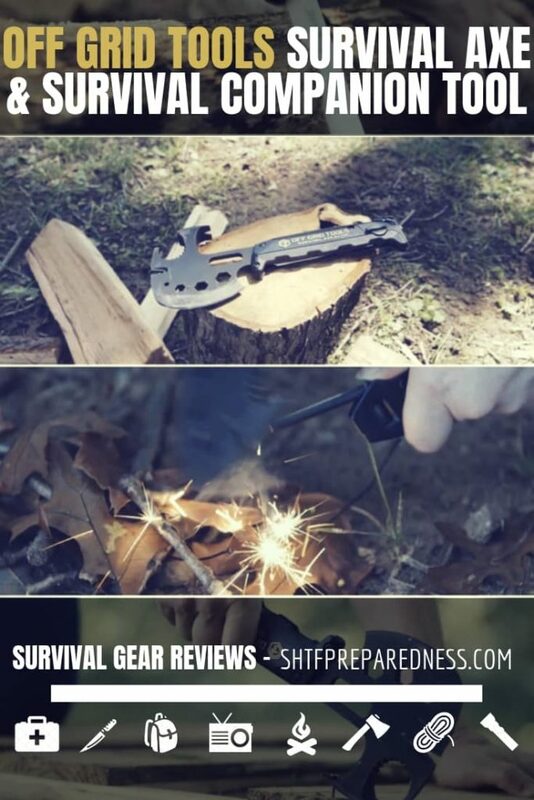 What the survival axe does better than most is offers you access to a number of tools. I am a big fan of carrying tools. I think tools offer you all sorts of opportunities in the field and they can be very effective when other things like ammo and guns cannot. As you know, I have mentioned redundancy of gear many times in my reviews. Redundancy is a powerful part of any survival philosophy. I like to have tools that work well, and I want a lot of them. Tools that make things like fire, water, blades and shelter a redundancy will give you an edge. In other words, give me as many options in these categories as I can reasonably carry. Of course, the other blade redundancy is in the hatchet blade. The blade size is decent for a hatchet and the rounded blade can do some interesting things. However, this blade came to me very dull and I assumed it needed to be sharpened. If the tool is used out of the box you will not be maximizing its effectiveness as a survival hatchet. You will need to put a sharp edge on this round blade. As a bonus I also took at look at the Survival Companion Pro by Off Grid Tools. This is another little tool with tons of features. The significant difference here is that the Companion could have a legitimate place in your EDC or everyday carry. This tool is small and effective. The Companion Pro is made of die cast aluminum. This design is durable and effective. Here is the list of features that this simple, 4.5 X 1.5 inch pocket tool can offer you. The Survival Companion Pro lends itself to all sorts of tasks. For me its about the fire redundancy of the ferro and magnesium rods that make this tool shine. The whistle is a great tool to have on hand as well. Also, the carbide blade sharpener is a terrific addition especially if you have no other option for honing and sharpening blades. Better carbide than a rock. After working with the tool for a few minutes I realized that this could be one of the best tools to give to your child. 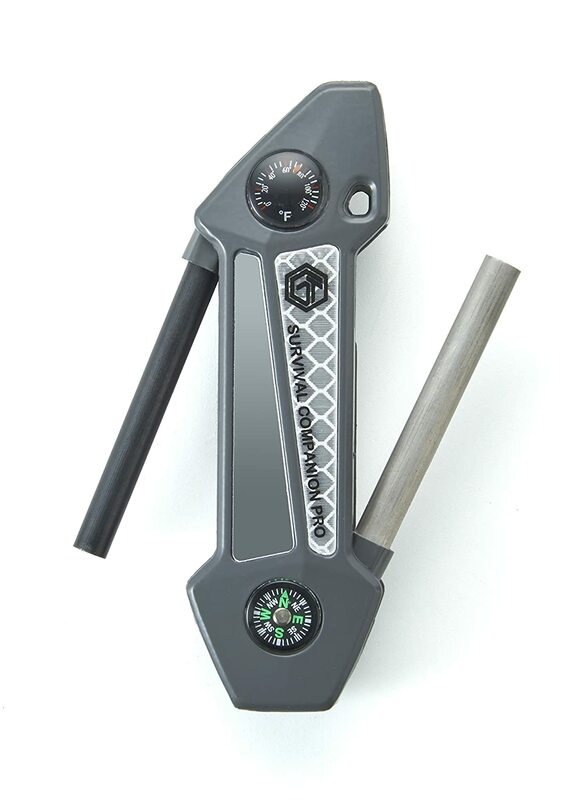 The Companion Pro gives your child the ability to carry around a James Bond style pocket tool that does not have a sharp blade attached to it. The items on this pocket tool are important and not just throwaway items to appease a child. Giving your child a whistle in the woods is very important. These two tools are survival gadgets. There is no getting around that fact. The Survival Axe needs to be sharpened, but that is a skill you need practice on anyway. Both tools deserve a place in your pack. I would encourage you not only to throw them in a bag but to take them out into the wild and really give them their due. Use your survival axe to complete tasks. Use the Survival Companion Pro to start fire. These are the survival version of multi-tools and the more you use them the better they will be to you! Gear Guru for SHTFPreparedness.com and host of the I AM Liberty Show, James Walton is a freelance writer, speaker and personality in the survival and preparedness world. His book Come Unity; Community is about cohesion and disaster preparedness on a neighborhood level.